Abstract: Model Predictive Control (MPC) is one of the most advanced real-time control techniques that has been widely applied to water resources management (WRM). MPC can manage the water system in a holistic manner and has a flexible structure to incorporate specific elements, such as setpoints and constraints. Therefore, MPC has shown its versatile performance in many branches of WRM. Nonetheless, with the in-depth understanding of stochastic hydrology in recent studies, MPC also faces the challenge of how to cope with hydrological uncertainty in its decision-making process. A possible way to embed the uncertainty is to generate an ensemble forecast (EF) of hydrological variables, rather than a deterministic one. The combination of MPC and EF results in a more comprehensive approach: Multi-scenario MPC (MS-MPC). In this study, we will first assess the model performance of MS-MPC, considering ensemble streamflow forecasts. Noticeably, the computational inefficiency may be a critical obstacle that hinders applicability of MS-MPC. In fact, with more scenarios taken into account, the computational burden of solving an optimization problem in MS-MPC accordingly increases. To deal with this challenge, we propose the Adaptive Control Resolution (ACR) approach as a computationally efficient scheme to practically reduce the number of control variables in MS-MPC. 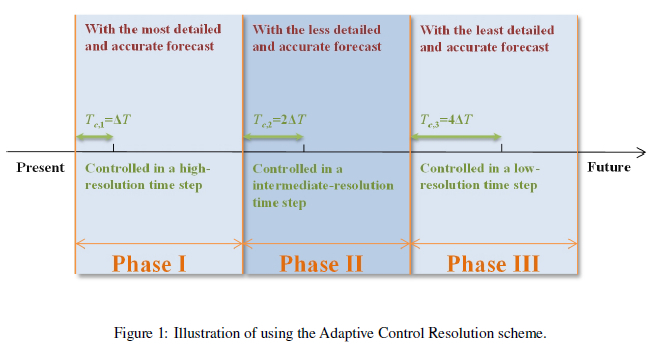 In brief, the ACR approach uses a mixed-resolution control time step, based on the change in the forecast accuracy from the near future to the distant future. The ACR-MPC approach is tested on a real-world case study: an integrated flood control and navigation problem in the North Sea Canal of the Netherlands. Such an approach reduces the computation time by 18% and up. At the same time, the model performance of ACR-MPC remains close to that of conventional MPC. Reference: X. Tian, R.R. Negenborn, P.J. van Overloop, J.M. Maestre, A. Sadowska, N. van de Giesen. Efficient multi-scenario model predictive control for water resources management with ensemble streamflow forecasts. Advances in Water Resources, vol. 109, pp. 58-68, 2017.